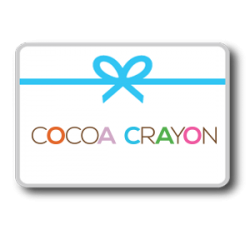 Give the perfect present every time with a Cocoa Crayon Gift Card. Always the right size, color and style. It offers freedom, flexibility and can get to the recipient instantly. Choose any value you like. At checkout you’ll have the opportunity to enter a personalized message and the recipient’s email address and voila! A pretty email will be sent to the gift recipient, including the code to redeem their gift card online whenever they’re ready.